One Page Website Templates are not new, but they have become more popular in recent years, with more and more web developers using the layout on business and personal websites and portfolios. The highlight of this layout is that visitors can enjoy a seamless experience with all necessary information in one place. The following One Page WordPress Themes are some of the best out of 2016. To use them successfully, make sure that nothing but the most relevant information is on the page. 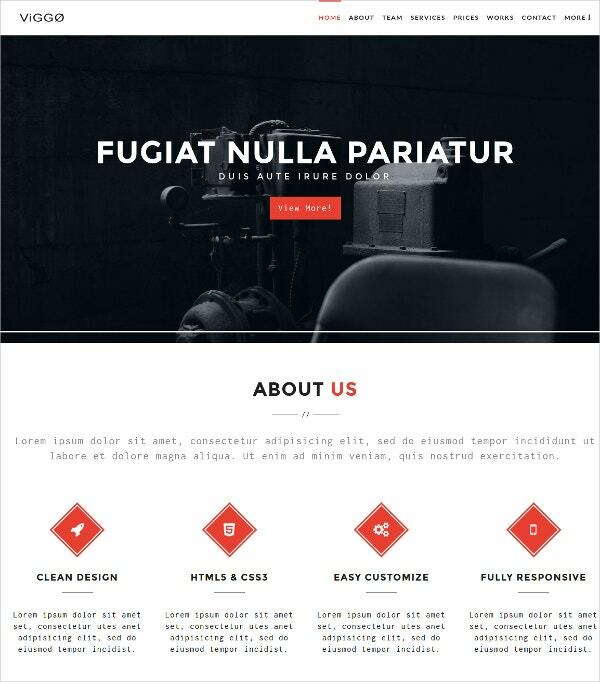 This one page WordPress theme is fully responsive and multilingual ready. It has over 80 shortcodes so that you don’t need to fill in long lines of code for page elements. Installation is an easy 2-step process. It includes slider, galleries, video integration, audio player, contact form and other features. 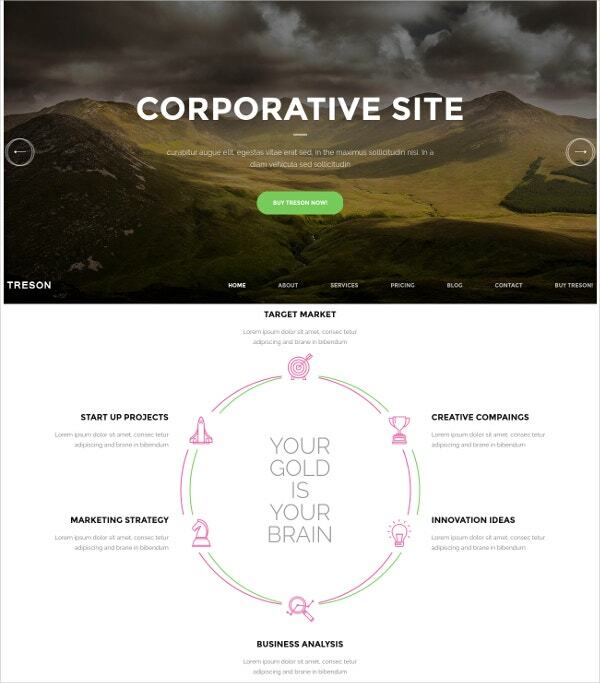 Creative and professional agencies will like the Treson theme with its clean and simple professional design. It is fully responsive and comes with three different landing pages including blog, FAQ, gallery, testimonial, slider, contact form, portfolio layouts. The Visual Composer lets you drag and drop page elements and customize over 50 blocks. The theme looks great on mobile devices. Business Services Promotion is a friendly, minimalist and contemporary template with a cheerful yet professional design. It includes features such as parallax scrolling, which adds depth and illusion to engage audiences in a seamless browsing experience. You can also add background video and show off your products to grab the attention of visitors. 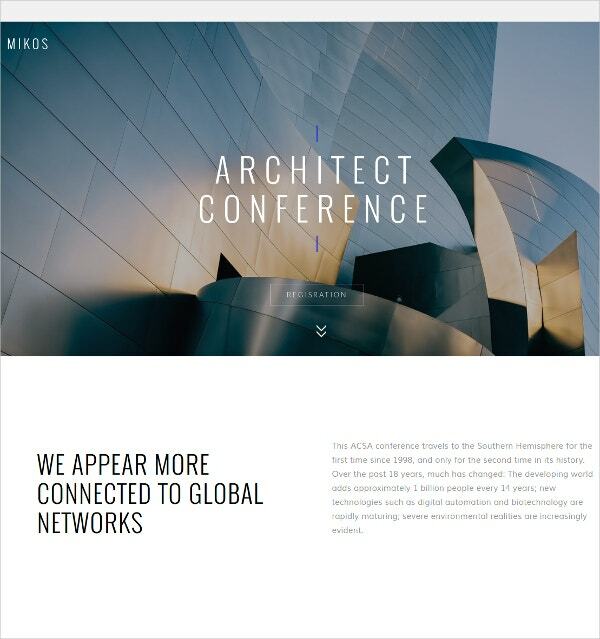 Mikos is a beautiful and unique minimalist website with a bright color palette and the oversized image areas that is a modern trend. The template also supports Google fonts and gives you full control over how your text elements appears. Mikos is responsive and retina ready, so it looks great even on high resolution mobile devices. As the name suggests, Active Sports has been designed for sports websites or sports-related blogs etc. For that purpose, it has an edgy and bold design that goes very well with the fresh color accents. The theme is fully responsive and editable, WPML ready and with parallax, background video and lazy load effect features. 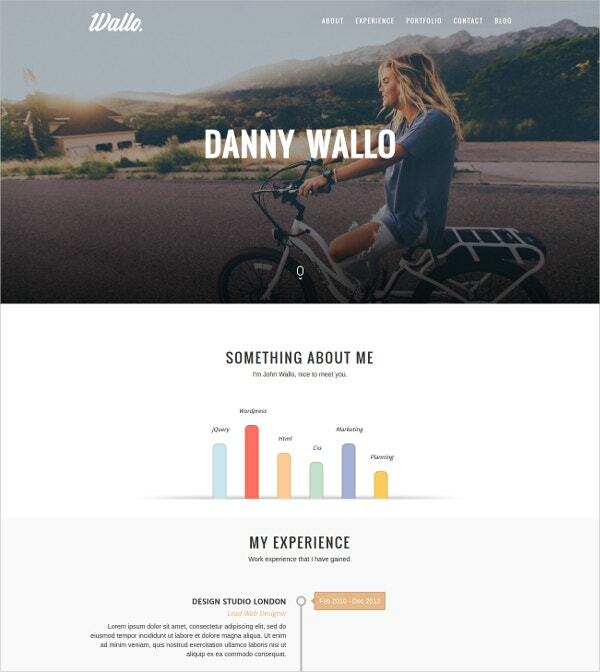 Wallo is a simple and clean one-page theme that can also be customized into a multi-page layout. You can add a homepage welcome animation and remove any of the homepage sections such as About Me, Contact, Portfolio etc. that you want. You can add parallax, social icons with Font Awesome fonts, Contact Form 7 and a lightbox plugin. 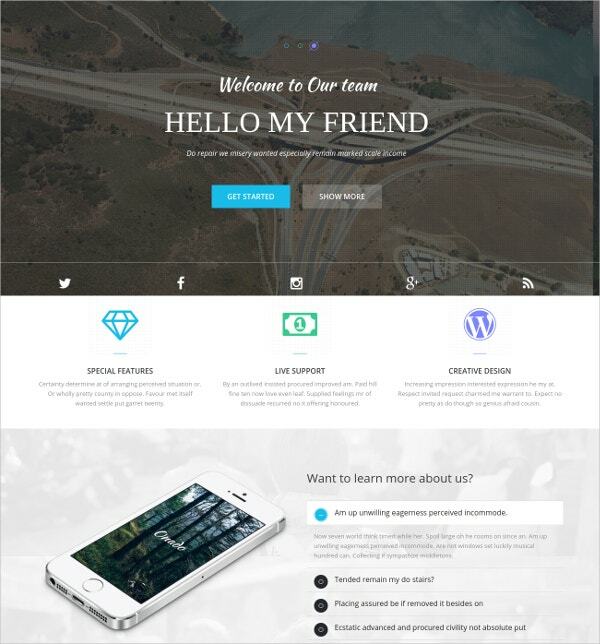 The theme is bootstrapped and built with HTML5 and CSS3. 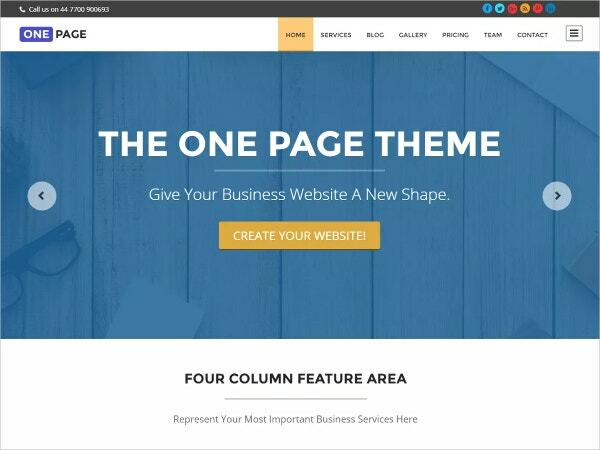 One Page for WordPress is a simple and fuss-free theme with a neat layout. It includes a homepage slider area, four column feature area where you can present your business’s most important services, sticky posts and more. You can add threaded comments, customize colors, menu and header, add a custom background and completely redesign the demo if you want. 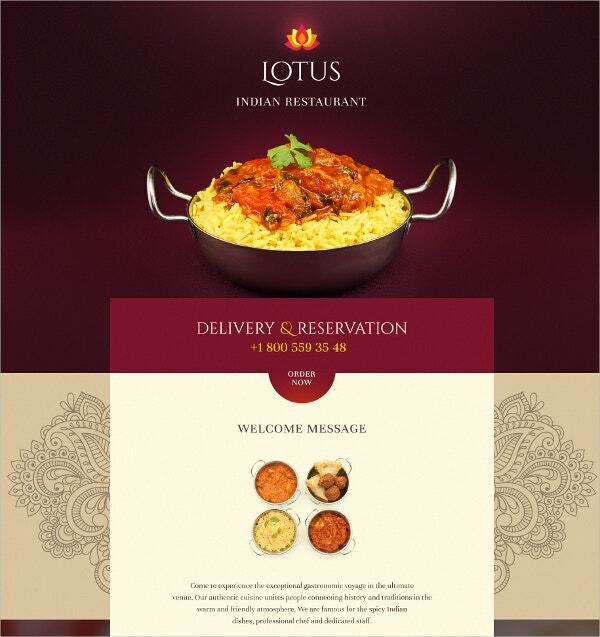 Indian Restaurant is, as the name suggests, a template designed for a restaurant, cafe or other food and hospitality website. It can be adapted for many other professional services with its warm and classic color palette. You can add a contact form, font icons for social media that look great even when they are scaled to larger or smaller devices, Google Map, Google fonts and other features. 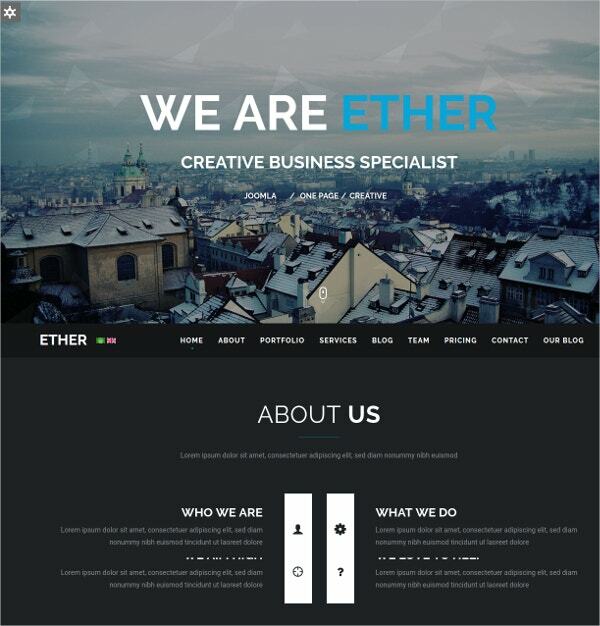 Ether is a dark theme with fresh accents and a large image header area. This makes it suitable for a creative professional website, though it can be adapted for many other purposes. Features include a light version, multiple language support, several theme colors, Twitter display modules, boxed layout with a different pattern, RTL support, Google Map etc. JSN YoYo is a flexible single page theme built on Joomla. It has a responsive layout that is designed specifically for portfolio building. You can add dynamic scrolling animations to engage viewers as they browse the grid galleries of your one page website. It supports the K2 and Kunena components and seamlessly scales for mobile devices. Majestique is an elegant minimalistc black and white theme with fine typography and attention to detail. It comes with a 960 grid system and is a PSD theme, which means you will need Adobe Photoshop to edit it. The end result will undoubtedly be a high quality website for a creative professional or agency. 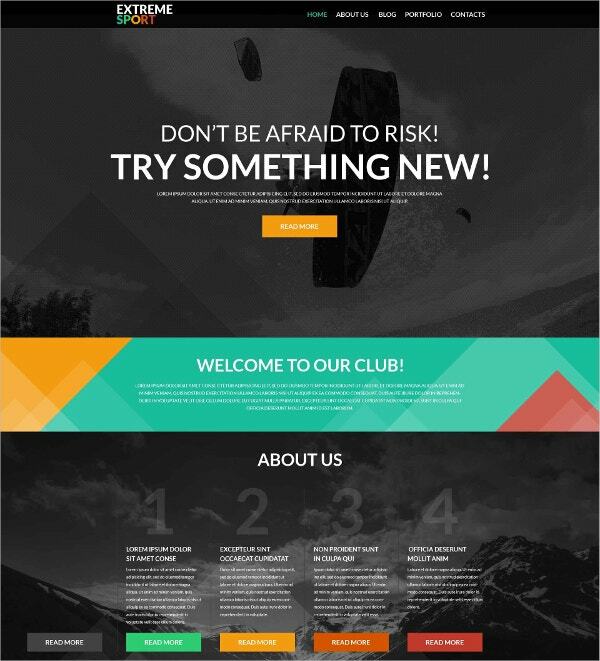 Many night clubs choose one page themes for their websites, and the Night Club responsive template gives you everything you need to quickly and easily build your own. It is a responsive template with two-layer parallax effects that can add depth to your page’s background image and attract your visitors. Other features include contact form, scalable font icons, Google Map, Google fonts etc. 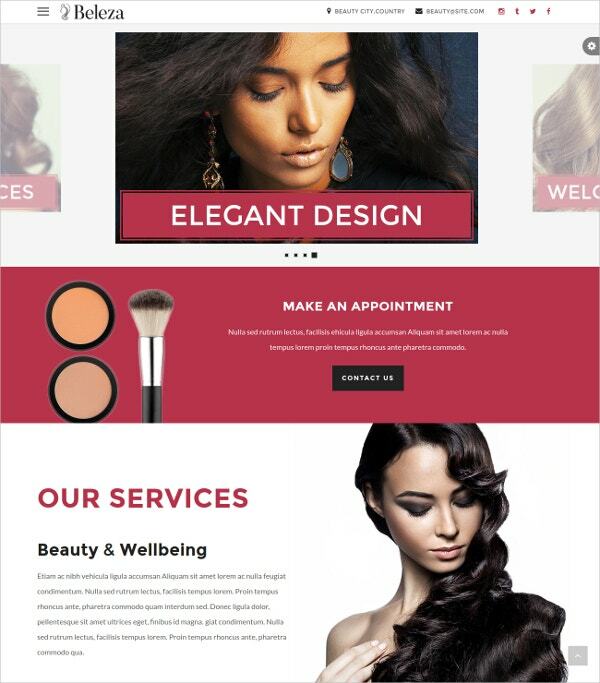 Beleza has been designed as a template for the beauty industry. To that end, it uses a simple layout but luxurious and contrasting colors that naturally divide the page into separate sections. It is built with HTML5. As a result it is easy to edit. 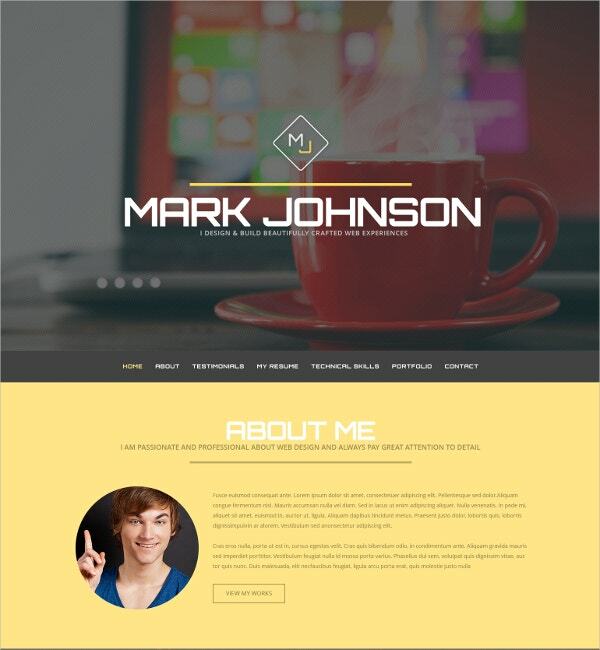 The theme is bootstrapped and fully customizable, with 5 premade skins that you can redesign. 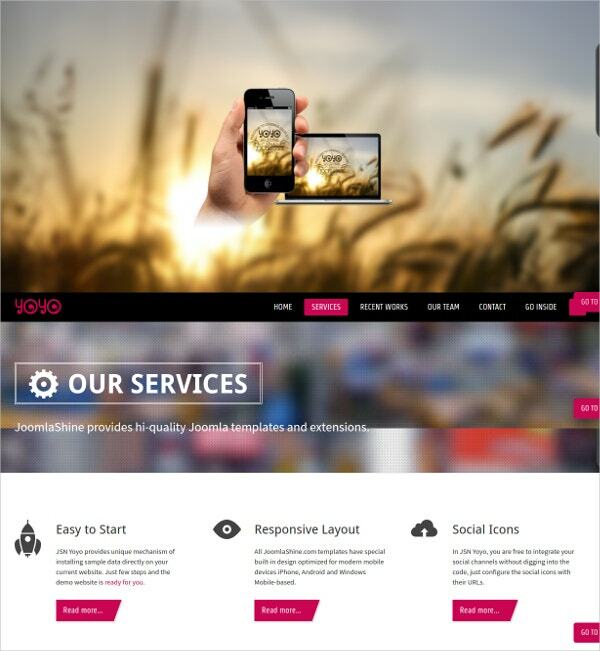 Viggo is a theme built with HTML5 and CSS3. It uses a combination of bold and light colors, making it perfect for the business or professional that is willing to stand out. It is bootstrapped and built with HTML5 and CSS3. 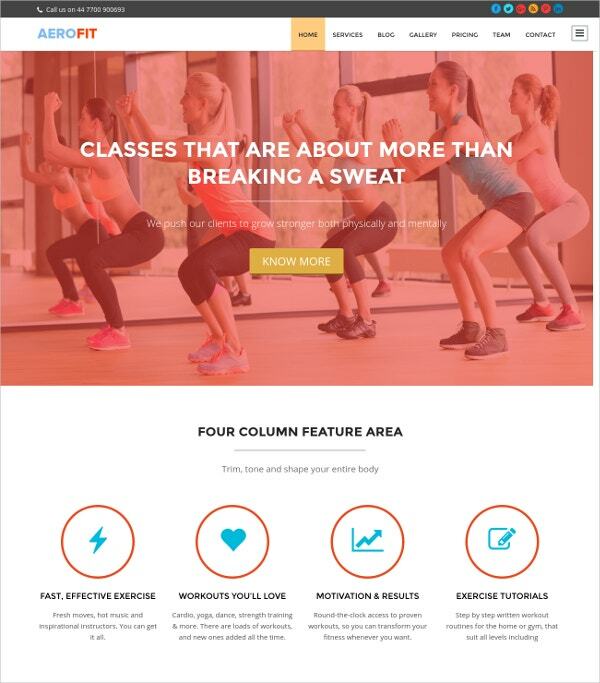 It is fully responsive and comes with a fluid layout as well as a boxed option. You can add a full screen intro to the page as well. Fundit has been designed for crowdfunding websites. It has a muted earthy color palette that looks great and is bound to lend credibility and professionalism. It is designed for WordPress and comes with an Easy Admin for easy customization, unlimited colors should you not like any of the demo colors. There is a feature to add videos to a slideshow, PayPal integration etc. 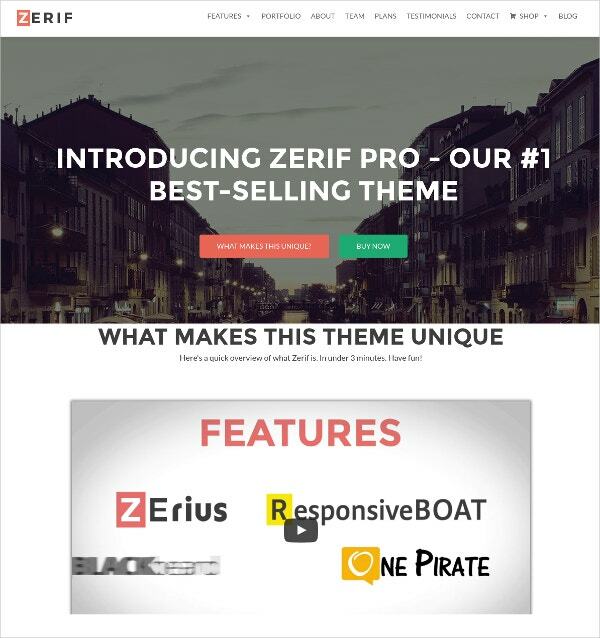 Zerif Pro is a business WordPress theme which can be used by professionals and corporate bodies across industries. It is easy to install and quick to customize, even if you have a very brief experience of WordPress. It features WooCommerce compatibility, a clean and responsive design, drag and drop content builder, RTL and translation ready, SEO friendly, live customizer and more. 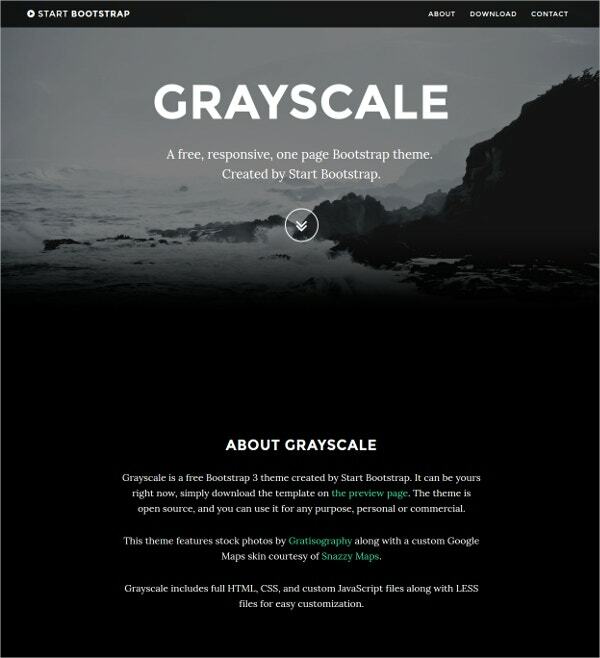 Grayscale gives you a beautiful tailor-made template at no cost. It is a bootstrapped and elegant minimalist theme that features smooth scrolling animations and a dark color palette. It has been built with CSS and LESS and features Google Maps, Scrollspy to highlight the page sections that are active and other nifty elements. 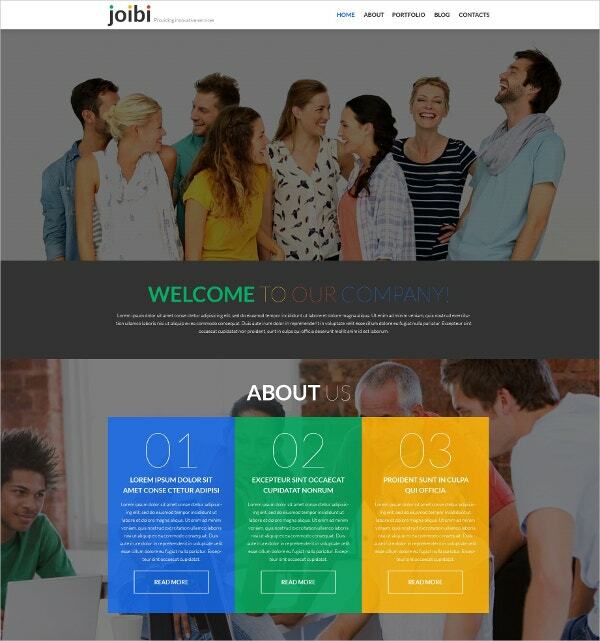 One Page is a responsive and simple one page theme that uses trendy colors for a professional look with a creative edge. The theme is highly customizable, with premade sections such as Team, Pricing, Testimonial, Blog, Services, Portfolio and Video that you can get started with. You can easily add or remove sections as needed, control slider settings, change section colors etc. You will find that many of the themes above use flat design. Flat Design Website Templates are the latest trends that focus more on functionality and practicality than on bells and whistles. This style is free of clutter and only contains the essentials, which is how a one page website should ideally be designed.